"How Much? How Little? The Space to Create" was developed for the 5 x 5 Temporary Public Art Project, which is a project of the DC Commission on the Arts and Humanities. Our signature 6 x 6 studio was sited in the Anacostia neighborhood of Washington, DC at THEARC (Town Hall Education Arts Recreation Campus). I constructed a simple lean-to greenhouse on the south side of the studio and used it to propagate seeds (provided by the Hudson Valley Seed Library) for the community garden at THEARC and for passers by to grow in their own homes. 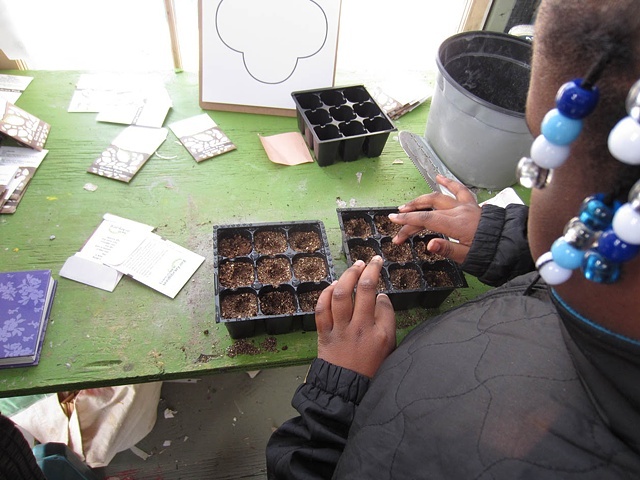 My experience in Anacostia lead to the development of an art seed pack for the Hudson Valley Seed Library. The seed pack exhibition known as "Art of the Heirloom" was brought to THEARC and feature in the Corcoran Community Gallery as a result of my visit.